Rugged and off-road ready, 4Runner is the perfect companion for families who would rather spend their weekends camping in the mountains than going to the local mall. The 2014 model was recently named on KBB.com's Best Resale Value top ten list and has several other awards on its resume as well, including an IIHS Top Safety Pick title and Best Retained Value award from Edmunds.com. This year, the SUV receives added features and a bold exterior refresh, which includes new LED headlights, a more prominent grille, newly integrated vertical air intakes and other attractive styling changes. 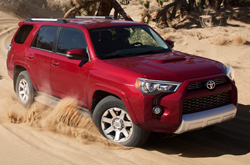 Learn more in the continuation of Kenny Kent's 2014 Toyota 4Runner review. Unlike the Nissan Pathfinder, Ford Explorer and other crossovers, 4Runner offers rugged dependability that you can count on when taking the SUV beyond the pavement. Its hardwearing body-on-frame construction and available off-road tuned suspension are ready for anything the trail throws its way, and with a generous stock of standard features you'll enjoy an enhanced commuting experience no matter where you travel. Shoppers in the southeast region of Indiana can find the 2014 Toyota 4Runner for sale in Evansville at Kenny Kent Toyota. Visit today to browse inventory. Available trim levels include the entry-level SR5, performance-enhanced Trail and luxury-focused Limited. Parents will appreciate features like the SUV's 40/20/40-split-folding and reclining rear seats, Bluetooth hands-free phone and audio streaming, satellite radio, cruise control and trip computer, or optional voice-activated navigation system. An Entune App Suite with Facebook Places, Yelp, Bing, MovieTickets.com, real-time traffic and real-time weather is also available. Together, this is just a fraction of the equipment that 4Runner offers. Visit Kenny Kent at 5600 Division St. near East Lloyd Expressway, where the 2014 4Runner is on sale in Evansville, IN right now! Schedule your test drive today by filling out our online contact form, or if you stop by during store hours one of our sales associates will assist you. See video of the SUV's cabin and new exterior design in the remainder of our 2014 Toyota 4Runner review below. When you compare Toyota's most current 4Runner model to the 2014 Dodge Durango, Jeep Grand Cherokee, Honda Pilot, Chevrolet Traverse, Hyundai Veracruz and the Nissan Pathfinder, you'll realize that it outperforms the competition. 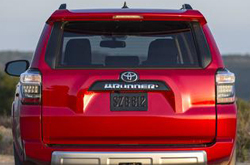 The 4Runner's got several great attributes, including its convenient cabin features and attractive looks. When comparing its price to the competition you will easily see that Evansville Toyota customers select it because it's a truly outstanding value. Find even more details; see our quick-facts list for the 4Runner - bullets below. Thanks for choosing Kenny Kent Toyota as your resource for 2014 Toyota 4Runner reviews and comparisons. We're a prominent car dealer in Evansville for a reason, part of which is that we provide reviews transcribed by well-informed writers who are at the height of their craft. 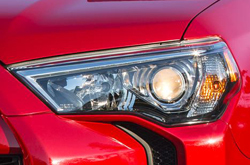 Every article comes crammed with helpful facts, specs and research - just what you need to make informed decisions about your next Toyota purchase. Now that you've learned all about the 2014 4Runner, we'd love to have a conversation about how we can help you; fill out the form on the right to message us today to learn about limited-time dealership offers and schedule time for a test drive!